RoboWorm's Original 6" Straight Tail Worm is a robotic hand poured triple colored worm featuring Roboworm's exclusive "Salt Release System." This system infuses the head of the worm with salt allowing it to slowly leech out during your cast, then when a fish bites, a burst of salt is released causing the fish to hold on longer for a better catch ratio. 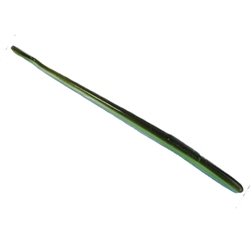 These straight tail worms excel in all applications, including drop shotting, shakey head, texas rig, carolina rig, dart head, split shot rig, or flippin' & pitchin'.